Below you will find a selection of Featured Books whose main theme is Nanotechnology or Nanoscale Science, from the team at American Scientific Publishers (APS). At the request of the publisher, APS, shipping costs on all multi-volume books will be determined once you place your order (we will contact you via email or phone once you place your order). The exception is the Encyclopedia of Nanoscience and Nanotechnology. 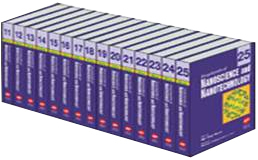 International Air shipping and Continental US shipping are shown for all single volume books. Click here for all other nanotechnology books. Covers topics on recent synthetic strategies to fabricate metallic or semiconducting nanoscale clusters and crystals, nanocrystalline films, control of size and shape of clusters and crystals, growth mechanism, spectroscopic characterization, amorphous and crystalline structures, physical properties and potential industrial applications in transducers and photocatalysis.